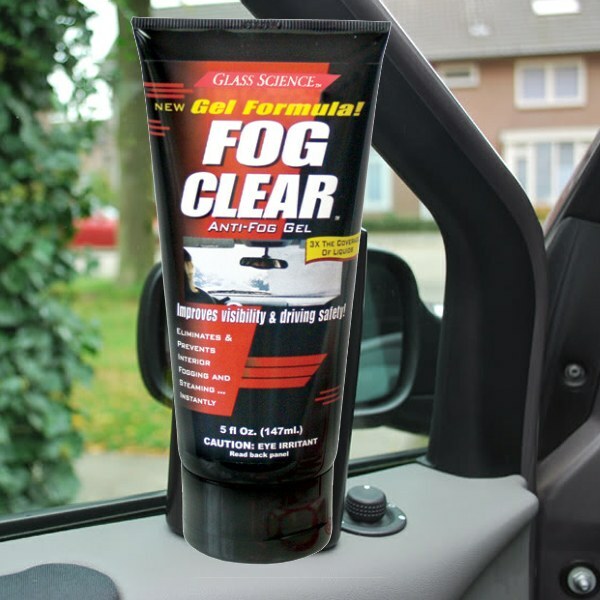 Fog Clear keeps your windows, mirrors, and windshield fog free - rain or shine! Glass Science Fog Clear Gel keeps your windows, mirrors, and windshield fog-free, rain or shine. Even in cold weather, Fog Clear Gel keeps working to maintain optimum visibility. Glass Science Fog Clear Gel works by filling in microscopic glass pores. Once the gel dries, it absorbs moisture to prevent fog from forming. Fog Clear dries completely clear and streak-free. Apply Glass Science Fog Clear to helmet visors, goggles, auto windshields and windows, and mirrors. Use Fog Clear Gel on bathroom mirrors to keep them clear, even during hot showers. Glass Science Fog Clear keeps glass clear and fog-free! A little of this concentrated gel goes a long way. Apply Glass Science Fog Clear to all interior auto windows and mirrors, plus helmet visors and goggles, to prevent fog, steam, and mist from obstructing your visibility. Works well to keep my windshield clear.